On just about every team in the National Football League, there is a player or players who just come of age, so to speak, and start playing to their potential if not better. When that happens, it makes the team better as they become strong or stronger at certain positions. Looking at the Buffalo Bills roster there could be a few young players who have seasons like that in 2018 and if that in fact happens the Bills will be the better for it. I know, your first thought is how could White have a “breakout” year after his outstanding rookie year? It’s easy, he hasn’t even scratched the surface of how good he can be. For as many good plays White had a year ago he also had some bad plays and inconsistency. Now with a year’s experience I look for him to quickly become one of the better corners in the game. He has that type of talent! White had four interceptions a year ago and I see that number improving but not by much. Why do I say that? Because as he improves his game opposing quarterbacks will stop throwing at him which means newly acquired Vontae Davis better be ready. 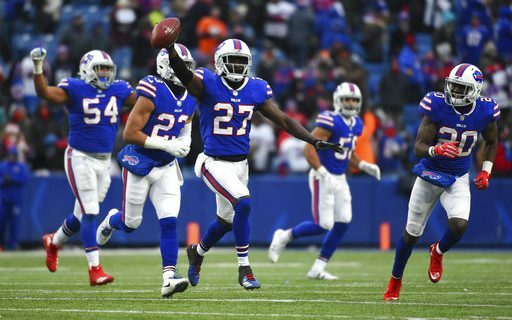 It would not surprise me that come December we will see Tre’Davious White as a Pro Bowl selection for the AFC. When the Bills drafted Dawkins I loved the pick. I thought that he would be better off playing right tackle or guard in the NFL even though he was a left tackle at Temple. He proved me wrong and I think we are just beginning to see how good Dawkins can be as an NFL player. When watching college tape I wasn’t sure that Dawkins had the feet and lateral agility to be a winning left tackle. That’s where I was wrong. His feet are plenty quick enough and what’s even more important is he knows and understands angles. When you talk to O-Line coaches and former players about offensive line play, they always bring up angles. A player might not have the top athleticism of some left tackles, but because he knows and understands angles he can play just as quickly as the better athlete. That is the case with Dawkins. As he improves his overall play, he will become a fixture at one of the most important positions on the offense. Milano was only a fifth round draft pick a year ago and wasn’t expected to play that much as a rookie. But then Ramon Humber got hurt, Milano was inserted into the lineup. Once he got that position he wasn’t about to give it up. Sure, when Humber got healthy he was re-inserted into the starting lineup but that didn’t last long as he couldn’t do the things that Milano could do. Milano isn’t the biggest guy at about 6’0 – 225 but he is quick, fast. Athletic and even more important, instinctive. He doesn’t see and then react, he anticipates and that is the key to good linebacker player. When Head Coach Sean McDermott was the defensive coordinator in Carolina he had one of the most instinctive linebacker groups in the NFL. He is trying to duplicate that in Buffalo. Like with Tre’Davious White, Milano has just scratched the surface of how good he can be. While he may never be a Pro Bowl type player he will be a player who the Bills coaching staff can trust to make plays and mot make mistakes. With a year’s experience under his belt I look for him to play much better in 2018. He has the talent to be an every down player because he can defend the run and play in coverage. Matt Milano will very quickly outplay his draft position.